ibison...been meaning to ask you about the string break angle at the saddle of your Yamaha...my 170 has a real low break, almost flat, and I`ve been watching a lot of em on the Jpanese web and most if not all the old ones seem to have the same thing. I tried to mevove the saddle to replace it but...feels ike it may have been glued in there and I don`t want to force it...so it doesn`t get played much, but I really like it and want to play it. I've never tried to remove a saddle. I had a real flat angle on a 230 12 string. It was bowing bad. Others? Show me an angle, I'll snap the pix. Is there a Dynamic group? So, I`m guessing when you say a flat angle you mean no break at the saddle...thats what I mean too. But...I`m not sure what the rest means...what do you mean by Dynamic group? Are you asking me to take a pic of my FG-170 so you can compare?... 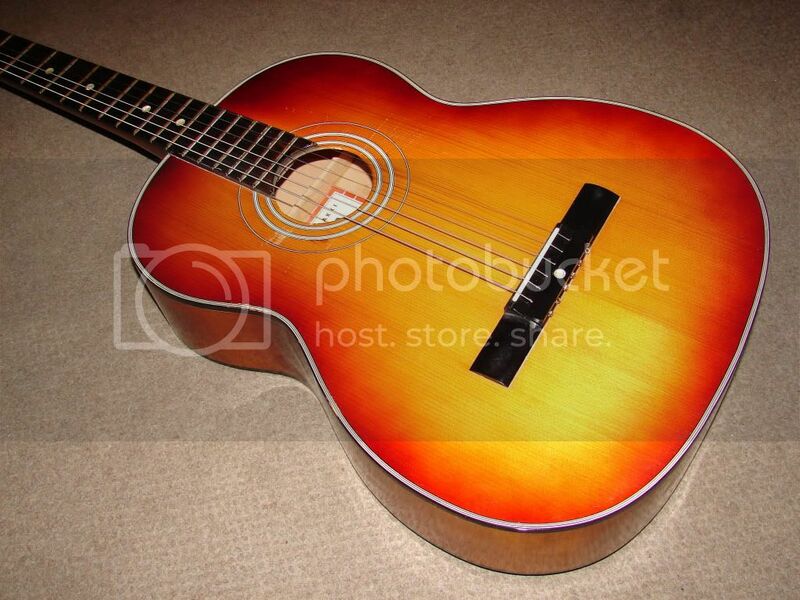 do you have any other acoustics you can compare the Yamaha with? On all my other acoustics, the saddles just slide or lift out when the strings are removed...can`t do that with the 170...feels stuck and due to it`s age I`m afraid it or the wood of the bridge may be brittle and break. sorry but I wanna make sure I understand what you`re saying. a picture of a nippon gakki fg-160 and fg-180 i used to own and sold them both. regret selling the 180, it was a real gem but i needed the money. i bought and sold a bunch of old yamaha's a few years ago when you could still get them at a reasonable price and resell, but now the word seems to be out. heres a link to a Yamaha on Yahoo Japan...not mine but the saddle break angle looks to be about where mine is on the 170. I realize the saddle is broken in the pic but I`m referring to the part that is not broken...scroll down a bit to see. In the Spring of 1969 I bought my FG-300 for $200.00 including hard case in Chicago. It's my son's guitar now as I passed it on to him in 1999. The pick guard came off as is, which I understand is fairly common on this guitar. It had a deep, loud and pretty balanced tone. It currently needs to be restored, new frets, neck, and impossible to find adjustable bridge and saddle. I now have a Larrivee L-05-12 and a Martin HD-28. I haven't played the Yamaha since I my son has had it. By the way, during this period of late 1960's early 70's both Yamaha and Takemine, where doing copycat guitars, with Yamaha copying Gibsons, and Takemine copying Martins. There was one Takemine model that actually made Martin pretty nervous, as it was that good and bettter than half their price. The FG-300 copied the Gibson Hummingbird. I have been offered a Dynamic. All there but well used. for $250 shipped. How does that price sound in the big scheme of things? find out the model number on the lable...and check the color of the label...pic would be great. For a rarer model that might be a reasonable price...for a common model well...I`ve paid as little as $20.oo for some that were well used. Most I paid for a #20 in near mint condition was $150.oo. Yamaha exported only a few models...#15, 30, 50 and 70... but the internet has changed everything, might be a domestic model. One way to tell is...my books mention that the Yamaha logo is arched on the exports while it is straight across the headstock on domestics. 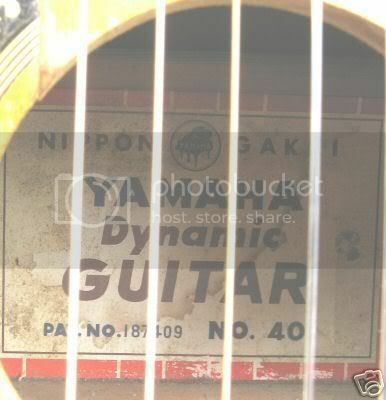 Make sure it actually says Dynamic on the headstock and not only on the label...the latter models were Yamahas first laminates. Just curious, re the little pearl dot on the Dynamic bridge, why is that there, and what does it cover up? I once had an old beater (brand unknown) that had a dot like that, when the bridge eventually lifted, it seemed like there was some type of screw under that pearl dot, since the bridge would not come off, and the loose bridge pivoted around that dot when moved. So, is it the same thing with the Dynamics, a screw under that dot, and why? remembered I have a #20 with several top cracks that I removed the tuners and nut from, it`s been on the balcony and out of sight... so tonight I removed the dot on the bridge and yup...theres a screw under there with a bolt on the inside. well, it`s been played a lot eh? Certainly not a student model, it sold for 6500 yen when it was introduced in Dec. 1961...that particular one could be from 1964, I don`t know of a precise way to date these...it does seem that the red and white label was the final color scheme before they went out of production once Yamaha began to build laminates. I have three #40s and they have the chunkiest necks of any Dynamic models I own...and they`re heavier too and they have beautifully flamed maple on the back and sides in tone burst. In Japan I doubt a seller would get $250.oo for one in that condition... but Dynamics don`t seem to be as numerous over there so hard to say what a good price would be. 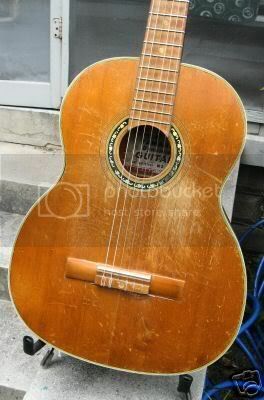 On the other hand...where you gonna find an all solid wood acoustic for $250.oo? I see some member are really buying into the red labels. I really think the newer FG's are a great deal. Unless you are a collector like Sneaky, I suggest you get a new one for the same cost. But then you get full warranty. You can also pick and choose the sound. New Frets. The Golden age of guitar building is now, you would really have to try hard to find yourself a bad guitar now days. Got more money? At about 500 bucks, the LS/LL/LJ laminate chronos series are very well built. Easily on par with the red-label era guitars. So if you are getting one to play on, get a new guitar. Unless you find one for dirt cheap. Unless you find one for dirt cheap. Hey ibisimon, did you buy that Dynamic #40 off ebay? I saw that one, then it disappeared, so someone must have made a deal with the seller, was it you?. Mine is similar, but probably has a bit more wear, and had an old Gibson pickguard on there at some time in the past. Despite the wear & a bit of bellying around the soundhole, it is a cool little guitar, sounds great (very deep & rich bass) and plays good and in tune, now that it has settled and I put in a bone saddle. These are really alot of fun to play, the perfect guitar to have nearby at all times, ready to grab, and also a good choice for a beater for travel, beach etc. Now I want to try one of the Dynamics with the steel rollers, that will accept steel strings, did you hear the examples on that website where the guy plays a bunch of Dynamic guitars with steel strings? Sounds good to me! more wear? wowzers... mine are in excellent condition. I have some Dynamics that look new...others well, they`ve been played a lot. If you guys like the Dynamics...you should keep your eyes open for old Yairis too...every bit as nice as the Dynamics of that period...I now have three Yairis made by the father...one from 1961, one from 1966 and the last is a 1968...all solid wood. Though I got them only a few months ago, I`ve bid on a couple of others since but they`ve sold for more than twice what I paid for mine...getting popular as players are discovering just how great they are. The early one looks to be flame maple while the others appear to be mahogany. The ones that have a personalized label stating they were order made for a customer are fetchin several hundered dollars now...and worth every penny. Nope. Didn't get it. I didn't want to set the new High water mark for the Dynamics price. They pop up often enough I'll wait for a deal or at least special. Yaris look great also. I need a bigger house! the labels on all 3 of my old Yairis look like this. How about a full pic of the Yairi? Are those classicals? I've seen old Yairi steelstrings, great guitars, some with Braz. wood, but the nut widths were narrow, less than 1 11/16. Seen a Dynamic like this? Anyone seen a Dynamic sunburst like this before? I haven't. Rather pricey though.